Divine Cheshire is an invited guest vendor for the Park Street Spring Festival on Sunday in Alameda, courtesy of Bead Inspirations! Come celebrate Mother’s Day with us. Unique, – Every one of my pieces is one-of-a-kind and includes unusual elements from my travels. High Quality, – I make sure to use quality materials and sturdy construction techniques so your art will last. And Affordable! – I always strive to have a variety of priced pieces. For this fair, I will have a selection of necklaces specially priced at $20 and up so that everyone can get Mom something very special and beautiful. 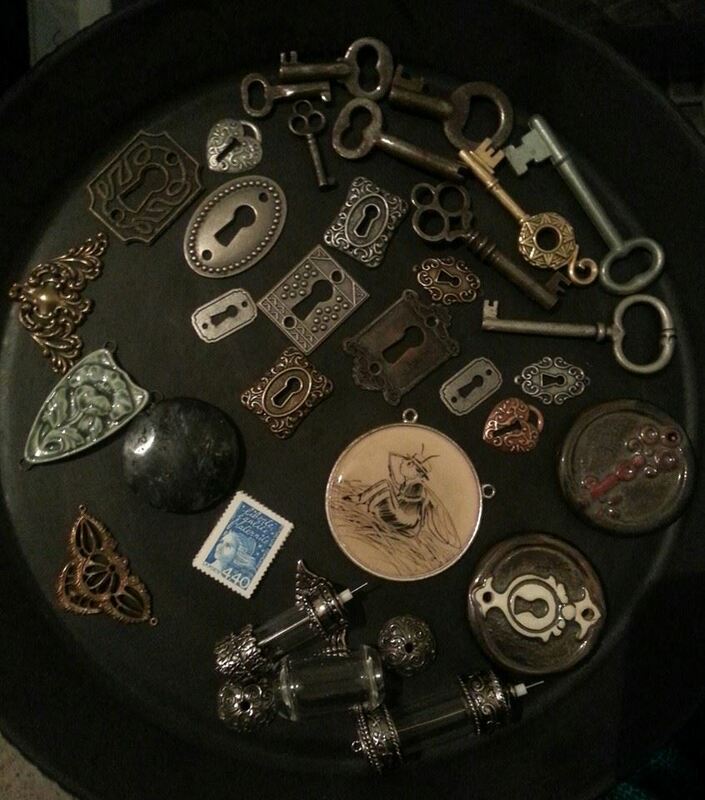 Here is a teaser process picture of my work tray with a few of the treasures I have selected as components. Many of these have already been turned into some wonderful necklaces, I’m pleased to report!